FX SCHOOL (4i) : What is Technical Analysis? In Forex trading, the term “Technical Analysis” or simply TA, refers to visual tools that help traders to determine whether to buy or sell a particular currency pairing. There are two types of TA tools. The first is using what’s known as pure “price action”. It refers to seeing how price has behaved recently, and how this can be used to estimate future price. The second is what’s known as “indicators”. These indicators/tools are based on mathematics and complex algorithms. In the past, before the advent of the personal computer, traders had to manually calculate and work out different formulae to apply to currencies/shares/stocks/etc… This as you can imagine was a lot of hard work and very time consuming. Fortunately, the tools we have today can be applied with a click of button, (on the brokers’ software platform) and instantly we have detailed information in a visual format, indicating to us, and allowing us to deduce and decide. You can see four different charts below containing extra visuals. Besides the actual candlesticks, there are other lines and bars. 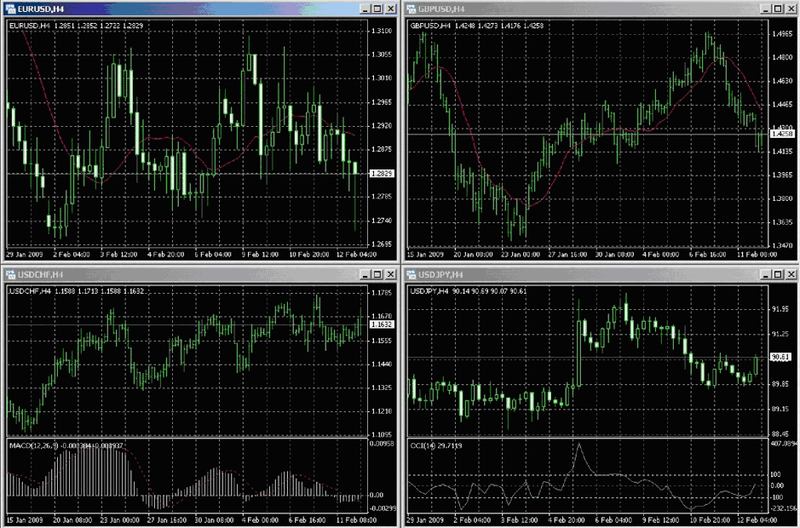 These are a few examples of indicators. More on indicators in a bit.